Wikipedia doesn't have a proper article about The Underground FSMer's of Westford. It really wouldn't help those so-called experts by writing one either. The Fl''ng Sp'gh'tt' M'nst'r said that an explosion would occur when anyone wrote His name, and that these guys took it a little too far. The symbol of the Underground FSMer's of Westford, also known as the Jewstafarians. Noticing that they were persecuted like the Jews, they combined the star of david and H.H. 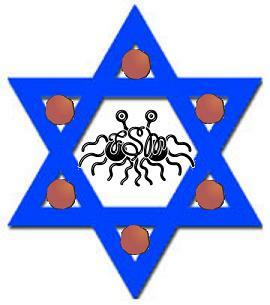 FSM to form their crest, which they would put on shields, if they had any. As all of those who have been touched by his noodly appendage know, the general community looks up on us with scorn. Much like the jews, we are stepped on by the boot of society (this is the source of our nickname, the Jewstafarians). There is a place of refuge for those seeking guidance and full pirate regalia, in a small town called Westford, (see homophobia for more information). We also have a tendancy to use apos'traphies where none are needed, as apos'traphies remind us fondly of the Noodly Appen'dages. Vowels to us are evil embodiments of the antithesis of FSM, violins. From this standing point it follows quite logically that we should forsake the name Flying Spaghetti Monster for the as-yet-not-so-widely-accepted form "Fl''ng Sp'gh'tt' M'nst'r.". Also, we think that the lowercase letter "l" in that looks suspiciously like an uppercase letter "i" so we're thinking of eliminating "l" too in favour of ', but that would be pretty complicated.. The Underground FSmer's accept all the branches of his noodly goodness, but hold many beliefs not shared by others. We claim Chuck Norris may have had a hand in creation, or may have been the midget spoken of in scripture. Also, we believe that the heaven of the great beer volcano and stripper factory may actually be a minor heaven of a sort, and that the greater heaven resides inside the Fl''ng Sp'gh'tt' M'nst'r. HIMself. This greater heaven would not have a beer volcano nor a stripper factory, but would actually be submerged in beer with strippers who spontaneously appear to serve the needs of those living there, and of course, free pasta. Of course, the Fl''ng Sp'gh'tt' M'nst'r. would allow us to breath the beer, and the strippers would be STD-free. The conceptualized Underground Pastafers idea of the upper heaven reserved only for them. These have not been embraced by the community by and large, so we live in secrecy, even from our own kind. Jon, the crazy homophobic pirate who likes Walker Texas Ranger, may the pasta be upon him, directs the local FSM community. As such he leads us in our jihad against the toucan tirant of the neighbouring town, Chelmsford, the cursed cousin of the most holy parrot. Our resident pirate, God, teaches the little ones of the goodness of our supreme lord, most high Fl''ng Sp'gh'tt' M'nst'r.. Ben, keeper of the parrot, helps Jon with his leadership decisions. This includes which eye to wear the eyepatch on, and if we accept Moundarians into the safety of our cloister. The Mound, in its infinite wisdom, may be recruiting a little to zealously. In the society of the underground FSMer's of westford, it is a common belief that a piece of the holy pasta of the FSM once fell off in the shape of a man. This either became Chuck Norris, or was used by the entity known as Chuck Norris as a vassal. He traveled around the world, spreading his noodly knowledge through roundhouse kicks to the face, when one day he ended up in Westford. To make a long, long, story very short, the people of Westford cooked him and ate him, sensing instinctively he was part pasta. 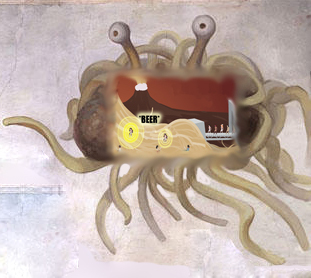 This is how the group was originally formed, and through his pasta body they sensed the truth of the FSM, and were shunned. The event is recreated in a ritual known as "The Sharing", in which Jewstafarians eat a small amount of pasta from a large communal bowl, to represent "the body" of Norris. After this, they are required to consume an amount of the accompanying sauce, which is thought to be The Chuck's "blood". It is rumoured that the Hol' Fl''ng Sp'gh'tt' M'nst'r. (may his name be blessed and free from vowels, even y, that unspeakable half-vowel), was so enamored with the secret sect which had eaten the legendary Chuck Norris that he had sent upon them a piece of his holy Saucon, which the Underground FSMers use to hide from the general populace. As such, they have studied this piece of the holy FSM, and have an entire book dedicated to how to prepare a mimicry of the saucon. They call it the 'cookbook'. Although the book is rarely read or seen, it is known that quail guts are responsible for its characteristic aroma. Ninjas, or satan's pawns, threaten our very way of life. The Underground FSMer's have a kill-on-sight policy for all ninjas, especially Colin Powell. We have sided heavily with the pirates, and shall lend all our support to their side. It is a common sight in Westford to see a ninja being burned at the stake. We're old skool. Less common executions are death by parrot, and overdoses from kitten huffing. This page was last edited on 28 March 2011, at 21:24.